Nerve cells (neurones) – these form the functional basis of the nervous system, responsible for transmitting signals as electrical or chemical signals. Glial cells – these provide functional and structural support for the neurones. 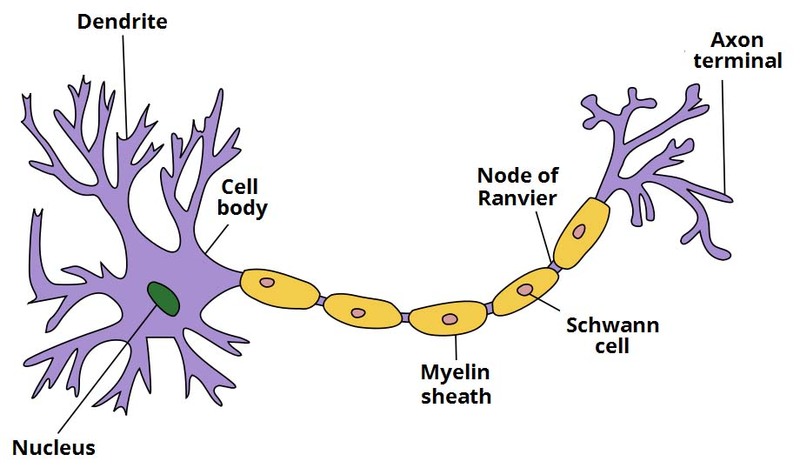 One example is a Schwann cell, which produces the lipid sheath of peripheral neurones. In this article, we will focus on the ultrastructure of nerves. We will look at the general structure of nerves, their layers of connective tissue and finish by considering some conditions that arise when the normal structure is lost. There are several different types of neurones found in the nervous system. They all contain the same key structural components – the cell body, dendrites, the axon and the axon terminals. 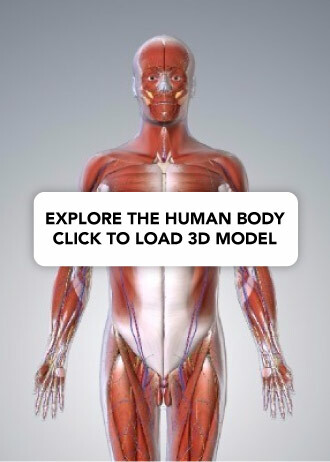 The cell body holds the nucleus. It is the site of protein synthesis, which occurs on small granules of rough endoplasmic reticulum called nissl substance. In the nervous system, many neuronal cell bodies can group together to form a distinct structure. In the CNS, this is known as a nucleus, and in the PNS as a ganglion. The dendrites are elongated portions of the cell body. They extend outwards, receiving input from the environment and from other neurones. The axon is a long, thin structure down which action potentials (the nerve impulse) are conducted. Whilst neurones have many dendrites, most cells only have one axon. Each axon is coated in myelin – a layer of insulating lipid. Myelin is formed by cells wrapping themselves around the nerve axon. In the CNS, this is performed by oligodendrocyte cells. In the PNS, Schwann cells are responsible for this action. There are gaps between the myelin sheaths formed by different cells. These gaps are known as nodes of Ranvier. They allow for saltatory conduction of impulses. The axon terminal is the most distal part of the axon. It is from here that the neurone sends chemical signals to other cells – usually via neurotransmitter release. To facilitate the secretion of neurotransmitters, the axon terminals contain a large number of mitochondria. Fig 1.0 – The components of a typical neurone. Fig 1.1 – Connective tissue layers of a nerve cell. 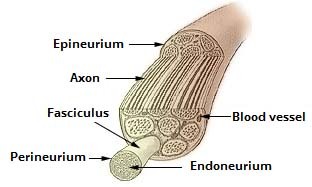 Endoneurium – Surrounds the axon of an individual neurone. Perineurium – Surrounds a fascicle, which is a collection of neurones. Epineurium – Surrounds the entire nerve, which is formed by a collection of fascicles. It contains numerous small blood vessels, which supply the nerve fibres. Epineurium appears on the nerve as it exits the intervertebral foramen. It is created by the fusion of arachnoid and pia mater, which are layers of the meninges. Neurones can be classified by structure or by function. Neurones with different functions have differing structures, which is visible histologically. Fig 1.2 – Structural classification of neurones. 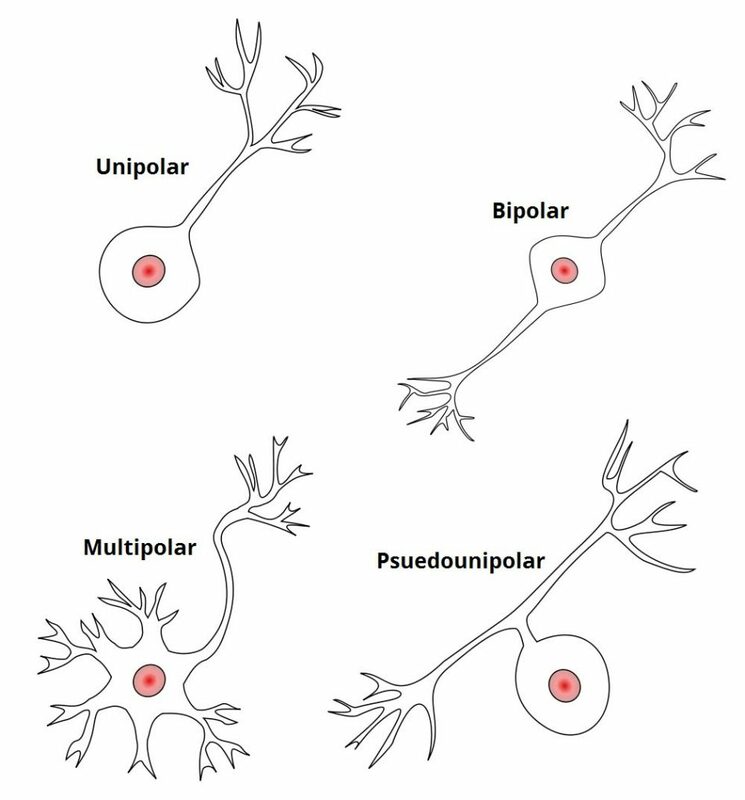 Neurones can be either unipolar, pseudounipolar, bipolar or multipolar. Unipolar – Here the cell body is at one end of a single unbranched axon, and there are no dendrites. These can be found in the cochlear nucleus of the brain. Pseudounipolar – They have one axon which is divided into two branches by the presence of the cell body. Sensory neurones are all pseudounipolar. Bipolar – These neurones have two processes arising from a central cell body – typically one axon and one dendrite. These cells are found in the retina. Multipolar – They have one axon and many dendrites, with a cell body displaced to one side of the axon. Motor neurones are a prime example of this. Sensory nerves – small axons and psuedounipolar structure. Motor nerves – larger axons and multipolar structure. Intermediate neurones – central cell body and many dendrites. Sensory and motor nerves are located within the PNS, whereas intermediate nerves are found in the CNS. 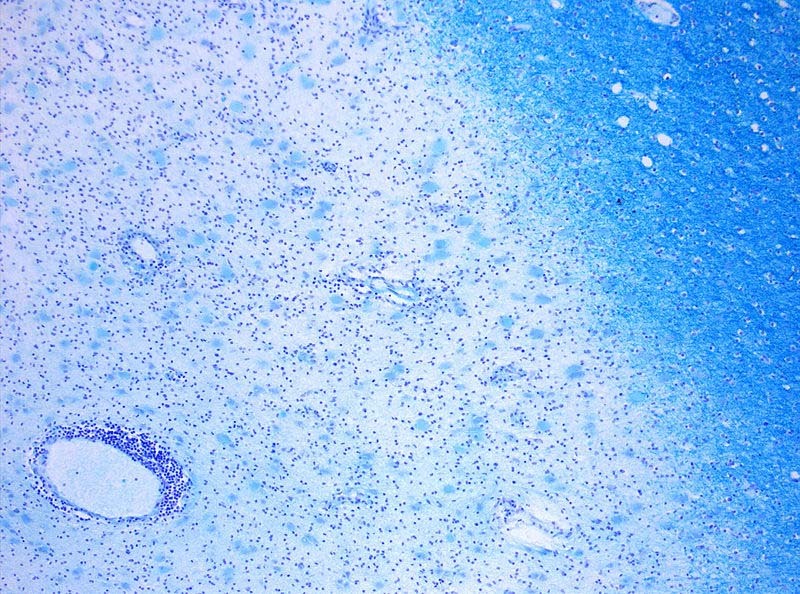 Fig 1.3 – Photomicrograph of a demyelinating MS-Lesion. In multiple sclerosis, the myelin covering of neurones in the central nervous system is lost. This means that the relay of action potentials between sensory and motor neurones is affected. This can lead to visual, motor and auditory problems. The etiology of Multiple Sclerosis (MS) is still uncertain. However, the causes are thought to either be as a result of autoimmune destruction of myelin, or the failure of oligodendrocytes to myelinate the interneurons. Motor Neurone Disease describes a group of conditions that include Amyotrophic lateral sclerosis, better known as ALS. In these diseases, motor neurones become damaged for reasons that are not entirely clear, but are thought to include dysfunctional mitochondria. The damage to the motor neurones is progressive, making this a degenerative disease. It often begins with damage to peripheral nerves, and works its way up through the limbs until the central nervous system is compromised. This disease is fatal, with a median survival length of 3-5 years post diagnosis. The perineurium surrounds which structure? Myelin in the central nervous system is formed by which type of cell?